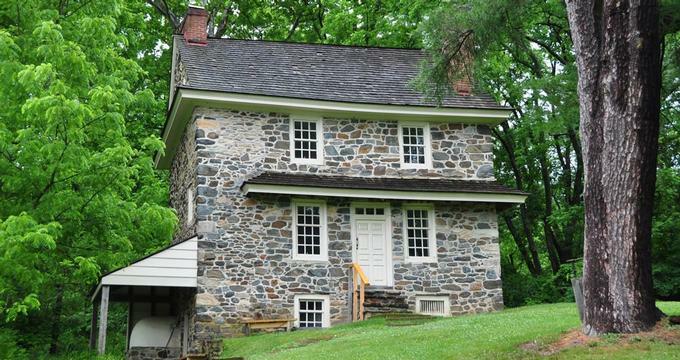 Established in 1684 as Birmingham Township, Chadds Ford, Pennsylvania is a charming historic community on the banks of the Brandywine Creek about 25 miles from Philadelphia, Pennsylvania in the Brandywine Valley. Surrounded by rolling hills and rich vineyards, Chadds Ford, PA was the site of one of the bloodiest battles of the American Revolution in 1777, the Battle of Brandywine. The historic district of Chadds Ford consists of 17 well-preserved buildings that include the Chads Ford Inn and Merchant Mill. You can almost hear the cannon fire as you stroll through the rolling green hills of the Brandywine valley, where in September 11, 1777 George Washington and the Continental Army fought British General William Howe and suffered a crushing defeat. What was then an American army encampment is today the site of the Brandywine Battlefield State Park, PA. 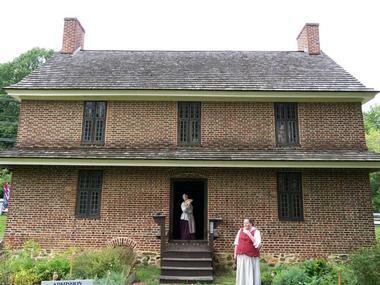 The park covers 52 acres and includes the house of the local farmer Benjamin Ring, which served as George Washington’s headquarters. Today the museum offers visitors the opportunity to walk through the rooms where Washington spent some of his darkest moments. The museum holds many objects from the battle such as cannons, maps, uniforms, and guns and offers visitors a 20-minute video about the Battle of the Brandywine. Perched on the banks of romantic Brandywine River, this appropriately named museum is classic and modern at the same time. It is located in the renovated 19th century stone mill with an addition made of steel and glass that mirrors the passing waters. It is world-famous for its collections of art of N. C. Wyeth, Andrew Wyeth, and Jamie Wyeth, but the museum also has an outstanding Heritage Collection of American art focusing on Brandywine valley. A collection of magnificent 19th and 20th century landscapes shows the beauty of the area, which attracted a number of great artists who made their home in the valley. There are also collections of significant portraits, still lifes, and illustrations that make the museum’s holdings diverse and broad. The Wyeth family home, with all its contents, is located nearby and is also part of the museum. The Chadds Ford Historical Society is a community organization with a mission to preserve Chadds Ford historic buildings, artifacts, and records for the Chadds Ford community and also for the thousands of visitors who come to learn about the country’s past, the tragic Battle of the Brandywine, and the way of life and hardships of the people living in the 18th century. The society manages The Barn Visitors Center and offers tours of The John Chads House and The Barns-Brinton House, where visitors are greeted by knowledgeable guides in historic costumes and are shown the traditional skills of Chadds Ford people, such as bread-making. The society also organizes a range of seasonal festivals such as Chadds Ford Days, the Candlelight Christmas Tour, and the Great Pumpkin Carve. Chaddsford Winery is located in a fairytale-beautiful 17th century barn in Chadds Ford between the Longwood Gardens and the Brandywine River Museum. Taking full advantage of the Mid-Atlantic Uplands’ microclimate, Chaddsford makes a range of wines for every taste, from fruity, light whites to rich, earthy, full-bodied reds, ciders, and sweet wines. The winery has been in business since 1982 and is currently producing 30,000 cases of wine per year, garnering high acclaims from customers and wine connoisseurs worldwide. It is one of the oldest wineries in Pennsylvania. The winery is open for visits daily, so go have fun and stock up with your favorite wines, or join one of the many village festivals and events in Chadds Ford in which Chaddsford Winery proudly takes part. Located in the country home of Christian C. Sanderson, a teacher, lecturer, historian, musician, and collector, Christian C. Sanderson Museum is a place that reflects this interesting man’s life, the lifestyle of the era, and, through the collected artifacts, 200 years of the country’s history. 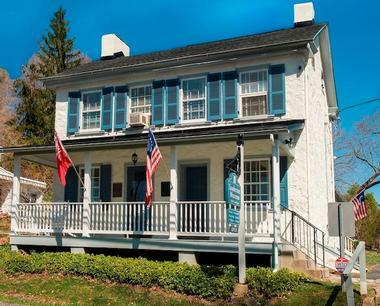 The museum showcases collections of objects that reflect the life of Chadds Ford and various collections of objects Christian Sanderson acquired during his life that describe the history of the area and the country and some of its more important moments. 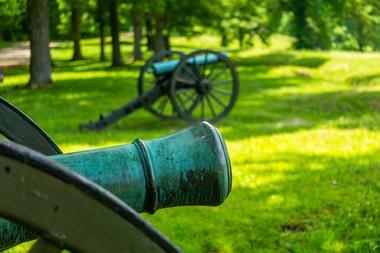 There are artifacts from the American Civil War, the Revolutionary War, two World Wars, and the Battle of Brandywine. There are also original Wyett paintings and drawings, some of them of Sanderson. Gino Razzi firmly believes that Pennsylvania can produce world-class wines from its own vines and has spent the last 30 years proving his point with excellent results. With his mature 25-year old vines and a young daughter Carley Mack to take care of marketing and the wine tasting shop, Gino has developed highly acclaimed and award-winning wines that he sells in many Philadelphia restaurants. To get the full experience, visit the vineyard and the wine tasting shop in Chadds Ford and taste his Traminette, sauvignon Blanc, or Italian-style Bordeaux. Get some cheese or pate to go with it and make it a nice picnic. The vineyard is a popular venue for music evenings, weddings, and other social gathering. The Gables is located in an old converted dairy barn with elegant high-backed banquettes along the exposed brick walls and a popular bar with metal and red leather stools where you can see locals and tourists perched together enjoying local brews, the excellent wine selection, or interesting cocktails. Executive Chef Dave Wenerd will treat you to New American cuisine with interesting European and Southern touches, created with his own interpretation. Located in the beautifully restored 1703 stone cottage, Brandywine Prime is an elegant and upscale restaurant very tastefully decorated with original details that give it a special charm. Chef Jason Barrowcliff offers traditional American fare with excellent chops, steaks, and seafood, adding organic produce from his own garden. Brandywine has a nice, well-chosen wine list, but guests are allowed to bring their own favorite bottle as well. Sunday brunches are extremely popular, lavish, and delicious. Sit on the lovely outdoor terrace on a sunny day and you will be transported to Chadds Ford’s distant past. 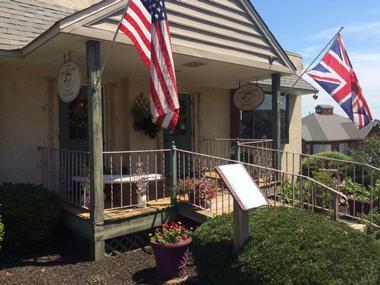 Everything about Chadds Ford is linked to the past, so it is natural that such a historic place has one of the biggest antique malls in the area. Located near the Longwood Gardens, Pennsbury Chadds-Ford Antique Mall has been attracting antique hunters from Philadelphia and even further for the last 36 years. Known for its large selection of high quality antiques, the mall occupies two stories of air-conditioned space filled with 180 display cases and booths from more than 100 antique dealers. 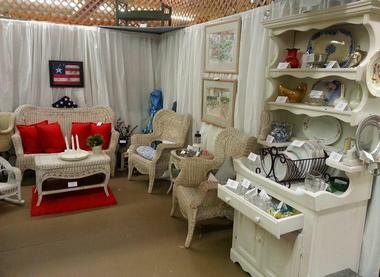 There is something for everyone, from antique toys, trains, and furniture to paintings, collectibles, and jewelry. Whether you are looking for that missing piece for your collection, a hidden treasure, or a vintage piece to decorate your home, you are sure to have fun. An absolute must-see on your Pennsylvania wine tour, Ten Gallon Hat winery is located in a beautifully restored barn in Chadds Ford. The cozy attached tasting room is called The Stable, and the lounge on the second floor under the vaulted ceiling is known as the Coral. Stop for a glass of wine or two, great food, or for some good local live music on Saturdays. Ten Gallon offers 11 different wines for sale that is made from grapes from Douglassville, MD, Lake Erie, New York, and Lake County, CA. They play with flavor to create new and interesting wines. There is something for every taste, but a few of the most popular are lightly sweet Cabernet Sauvignon, the Barbera with a touch of pepper and blackberry, the Merlot, and the Red Zinfandel. Antica is understated and simple, but warm colors and exquisite Wyeth prints on the walls give it a sophisticated flare, which is quickly reinforced when you get the menu. Chefs Josh Friedberg and Gent Mema offer Italian fare with their own take. Everything is wonderfully prepared and imaginative. Try Seafood Tagliatelle with shrimp, crabs, sun-dried tomatoes, asparagus, and a blush sauce. They make their own pasta, so you cannot go wrong whatever you choose. The lunch menu has a nice choice of sandwiches, or you can easily just eat appetizers – the rice balls with saffron stuffed with mushrooms, braised beef, and mozzarella are excellent. Chadds Ford is not only seeped in history but in art as well. A home to the Wyeth family of artists, with a number of great museums and galleries, the community also has an art studio that provides an opportunity for young artists to unleash their talents, discover their passion, and open themselves up to other possibilities. Art Beat is a working art studio that works through after-school programs and Summer Camps. It is open to the kids of all ages, and they can engage in the medium that interests them most: painting, mosaic tiling, pottery, glass making, jewelry making, or fiber art. The studio provides a pleasant, relaxing, and encouraging atmosphere and excellent trained and licensed PA teachers, and the rest is up to the kids. Arugula has a certain elegance. This Italian restaurant is sophisticated and beautifully decorated with original art, and the food is authentic Italian, and you will eat like you are visiting your Italian friend at his mom’s kitchen. 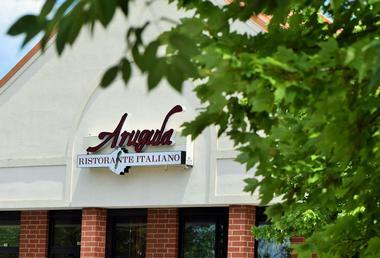 This family restaurant uses Lubrano family recipes and traditional cooking from central and southern Italy. Everything is made from scratch – they make their own sauces and breads and every dish is made just for you. Don’t expect standard Italian fare. Instead, you’ll enjoy surprises such as Nodino Valdostana - marinated veal chop, pan seared and topped with Fontina cheese and prosciutto, drenched in a red wine sauce. The restaurant is BYOB, so bring your favorite bottle of wine, just make sure that it does justice to good Italian cuisine. 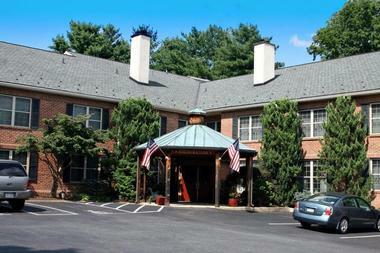 Brandywine River Hotel is perched on a hillside in the verdant Brandywine Valley in the center of the historic Chadds Ford, mere steps away from all the city’s attractions and restaurants. Offering all modern amenities but decorated with quality antique pieces, the Brandywine River Hotel is a peaceful oasis for busy travelers, families exploring the historic area, or couples on a short romantic retreat. A range of spacious rooms and suites have cable TVs, free Wi-Fi, and a work space, and some offer romantic touches such as cozy fireplaces and two-person Jacuzzis. Guests are treated to lavish continental breakfast and afternoon tea with cookies. Special Teas Tea Room celebrates the ritual of having a perfect cup of tea, something that is still part of everyday life in England, Japan and even Russia. A huge selection of the best teas from all over the world are offered together with home-made scones, pastries, sandwiches, and quiches in an elegant, quaint shop. Nothing is neglected, from perfect china pots and cups to lovely little plates and spoons. Having a morning or afternoon tea in the Tea Room is a great meal, but it also represents a little time stolen from the business of life to slowly sip the rich brew and exhale the stress out of your day. The shop also organizes very popular parties for various occasions.